It's Friday afternoon, Eastern Time, and this is your faithful Songbird with a calendar-related Friday Five for the RevGalBlogPals. Due to some confusion with our dates, I'm stepping in today, although I am usually here only on the 5th Friday, when there is such a thing. 1) Datebooks–how do you keep track of your appointments? Electronically? On paper? Month at a glance? Week at a glance? I still keep a Month-at-a-Glance paper calendar, published by the United Church of Christ. I love mine. I like the reminders the computer will give me, but I love being able to look at the whole month so easily. I only consider changing when I forget to open "my book" and wonder if I don't need the electronic reminders more than I thought. I have a cute, flowered dress with shoulder pads. Need I say more? Okay, circa 1995. I won't wear it (although I'm excited it fits again! ), but I will try it on and "ooh" and "aah" over it. 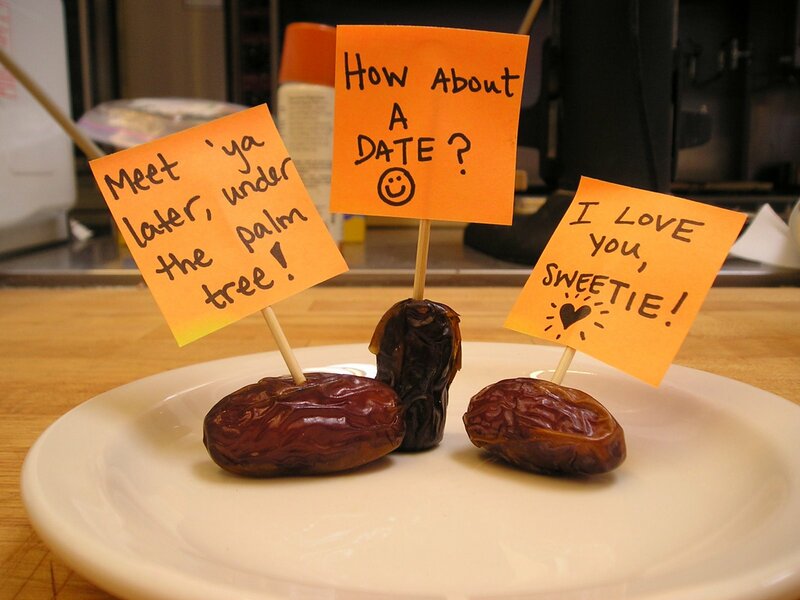 5) Dates–the fruit–can't live with 'em? Or can't live without 'em? Bleh, definitely can't live with them. Bleh. Fun play, Songbird. I watched all the reruns of Babylon Five when I was lying on the couch sick and pregnant with Katie, and I loved them. Totally agree on the dates. Blech. Wear that dress!! Even just at home. And I’ve yet to discover Babylon 5. It’s on my list. No idea what this Babylon 5 might even be. Since I have 436 items in my netflix queue, I will try not to find out! I used to love the UCC calendar when I was the church newsletter editor. And as a church secretary, loved the Lutheran and Methodist calendars too! I stole this for my blog! Thanks! I think I watched 5 minutes of Babylon 5 one night…. I love teh double booking self-care events — I think there is wisdom in it somehow. And your picture for today’s Friday Five made me laugh. Thank you. Oh! But dates are wonderful! They are like candy! This was fun. My son and I enjoyed Babylon 5 when it was first one. He had a houseplant he named after one of the lead characters, Bruce Boxleitner’s wife — can I remember names??? Dates I remember, names? Ah, shoulder pads… I think I still have some lurking in my closet, too!